And so was birthed the concept of the Keynesian Beauty Contest (though I find “playing the player” to have a nicer ring to it). While approaching investing as a poker game or gimmicky beauty contest may seem “low brow” for the “Harvard types”, it is precisely this mispricing of future expectations that lubricates “buy low, sell high” activities. 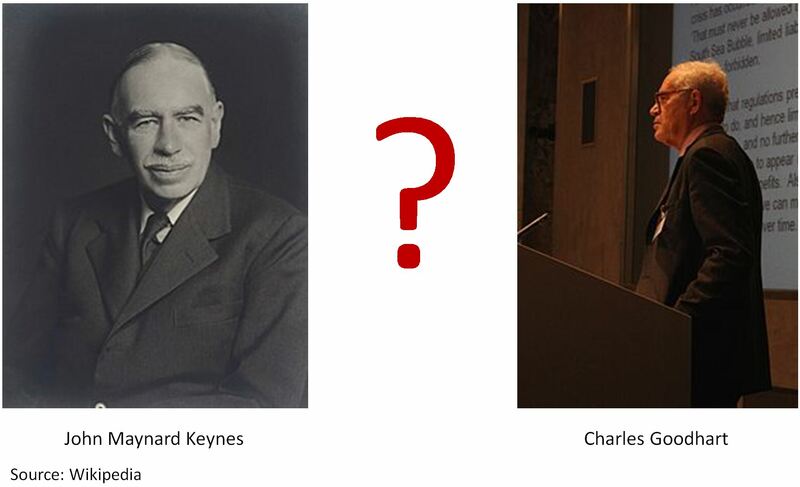 As Keynes was publishing his General Theory, another British economist destined for fame was born. Four decades after his 1936 birth, Charles Goodhart would introduce to the world his (now) famous law. While Goodhart’s Law was originally phrased differently, it is commonly stated as “when a measure becomes a target, it ceases to be a good measure” (this rephrasing has been attributed to Marilyn Strathern). Goodhart’s original usage was in British monetary policy, but it has many applications. The uncanny way in which China has precisely hit its GDP growth targets over the past couple of years is a shining example Goodhart’s Law. “If the emperor president requires 6.5% GDP growth annually, then we (the bureaucracy) shall deliver 6.5% GDP growth annually, and we’ll build ghost cities and uneconomic infrastructure in order to do so.” In other words, if policymakers put so much stock into a specific metric such that they interfere with it, that metric can lose its importance as a signal altogether. In a profound sense these two concepts invert the way in which we handle data. The Keynesian Beauty Contest removes a signal’s orientation to reality and reorients it to others’ reactions. Goodhart’s Law stipulates that we essentially ignore that which we’ve deemed to be of immense importance, precisely because it is treated as such. Both force us to evaluate signals using a higher protocol layer of game theory. But let us put aside our early 20th-century British analogies for a moment and get back to current events. As noted, the shape of the U.S. treasury curve (aka the yield curve) has been on a relentless pace of flattening. An inverted yield curve (where shorter-dated bonds have higher yields than longer-dated ones) has portended the last eight U.S. recessions making it one of the most reliable indicators of the sort. Standing just 38 bps from inversion (the 2’s-10’s curve), it has understandably garnered the attention of many market participants. The last recession not preceded by such an event occurred before 1960. Pretty powerful stuff, I know. Now, it’s important to realize that no causal link has been established for this relationship between the shape of the yield curve and the occurrences of recessions. To be sure there are theories, and quite reasonably sounding ones to boot. Most common of all is that the Federal Reserve tightens interest rates just a teensy bit too far and tips the economy into recession; or that an inverted curve dries up bank lending activity creating a slowdown (as they borrow short-term and lend-long term, earning the spread). Here, I offer no opinion as I can see rational arguments for both the affirmative and negative cases. As a macro-minded investor, however, what I care about most is the market’s reaction to such an event. Yes I know this is somewhat circular, but remember, we’re playing the player. By all means, one could easily argue that we’re in ahistorical times as it relates to interest rates. Never before in human history have nominal interest rates been this low in as widespread a fashion. Never before in human history have modern central banks intervened so directly in the capital markets. Thus, it’s reasonable to ask if history applies. Indeed, the smart researchers at Variant Perception have illustrated a number of points in a recent blog article that should give us pause. 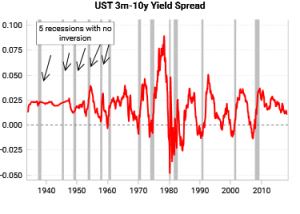 First, they note that while an inverted yield curve has preceded the last eight U.S. recessions, it failed to flag the five prior to those. 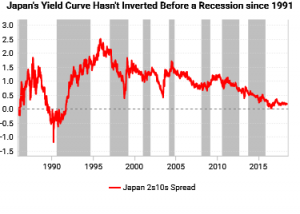 Even more interestingly, in my opinion, the Variant Perception team found that the Japanese government bond yield curve has not inverted prior to any recessions in their zero interest rate epoch (after 1991). They also note that false positives have been triggered in other international markets, such as in the U.K. and Canada. Thus, we have (again, in my opinion) some strong counterarguments to the reliability of a yield curve inversion as a recession indicator for the U.S. in a near-zero interest rate policy regime. The recent explanatory power of the yield curve has not been lost on policymakers either. Many have noted its predictive power, though not all are convinced. Ben Bernanke famously dismissed the inversion in 2006, chalking it up to a “savings glut.” And in a display of true humility, he did so again just recently, citing quantitative easing as a possibly distortive factor. (Some people have no self-awareness.) Regardless, a read of the financial press illustrates that an inversion is top of mind. Now the yield curve has not yet inverted and there’s no guarantee that it even will. With such immense scrutiny given to its shape by investors, businessmen (and women), central bankers, and government officials alike, it’s certainly possible for it to succumb to Goodhart’s Law and disappoint as a forewarning signal. In such an event other leading recession indicators would hopefully be triggered. When attempting to play the player the awareness of behavioral biases can be a powerful tool. The popularity of yield curve inversion articles should give us some confidence that investors are firmly anchored in recent history. Thus, should the yield curve invert, even momentarily, I believe that it’s best to make like Keynes and “devote our intelligences to anticipating what average opinion expects the average opinion to be”, and start judging other investors’ photographic tastes.